An inflatable recreational level raft is a raft that’s, as the name suggests, designed for recreational uses. Typically priced at $600 or less, these inflatable rafts are versatile, durable and are fun to use. But they aren’t for everyone. These rafts do have limitations—as all boats do. Certain people will find their boating needs match perfectly with the capabilities these rafts provide. Other paddlers, however, will find other inflatable boats more suited to their needs. I’ll never forget the story of a friend who bought a camo covered inflatable raft at Walmart. He used it for hunting waterfowl on a Montana river. On his first day out the boat developed a tear in the bottom while he was on a remote waterway in Montana. The result wasn’t happy. He walked a very long ways in very wet clothing in rather chilly weather – leaving the remnants of his boat behind. Needless to say, the hunting trip wasn’t enjoyable or productive. And really, that sums things up on inflatable raft quality. The world consists of many inexpensive inflatable rafts. However, these rafts can be divided into two categories – those that are good (and thus float and will last many, many years) and those that are bad (and will be lucky to last a season). Where can you find these cheap inflatable rafts? Simple, go to K-Mart or Walmart or some such place. You’ll find plenty of rafts around $150 or so. And you know what, these cheap rafts work ok for the kids to play in on a pond or something. However, never, ever take these rafts into remote areas or on longer river floats (and this includes long day trips, too). These cheap inflatable rafts are cheap for a reason – they are poor quality. And they will almost certainly fail you at a critical time. I’ve traveled hundreds of miles in my Sea Eagle 8 recreational raft in all sorts of weather and through all sorts of water. And yet it hasn’t developed a hole or a leak. And on top of that, my raft cost only about $100 more than the junk at Wal-Mart. So, if you are serious about floating rivers in a raft, do yourself a favor and get a good one. In the end, you’ll be happy you did. In some ways, it is easier to list the limitations of these rafts than it is their potential uses. So, this section lists out “activities” you do NOT want to do with a recreational level inflatable raft. Thus, you do not want a recreational inflatable raft if…. Inflatable rafts are neither sleek nor slender. In fact, they are rather fat. This is great for stability—you really have to work at it to capsize a Sea Eagle 9 inflatable raft, for instance. A solo paddler can, in fact, sit on the edge of the boat with their feet dangling into the water and not even come close to capsizing the raft. But this stability comes with a price—these rafts aren’t simply meant for long distance paddling. The front of the raft acts like a snowplow—pushing water ahead of it instead of cutting through water like an inflatable kayak or inflatable canoe can. The result is that, on flat-water paddles, progress is slow and paddling is rather tiring. This doesn’t mean you can’t row these rafts. Far from it. I’ve rowed my Sea Eagle 8 inflatable raft plenty. But it’s over shorter distances—such as going from one bank of the river to the next. Or paddling down a bit of flat water in a river that otherwise has a solid current. However, the one time I used my raft to make a lengthy paddle across a lake wasn’t the greatest of paddles I’ve had in my life—let me put it that way. Progress was slow and the rowing was tiring. Few recreational inflatable rafts have drain valves. Drain valves allow water that enters the boat to drain out. Of all the recreational inflatable boats I’ve seen, only the newly redesigned Sea Eagle 9 has drain valves that allows water that enters the boat to drain out. As such, when water enters most recreational rafts it needs to be bailed out, sponged out (using a specialty boat sponge) or simply tipped over and emptied when onshore. 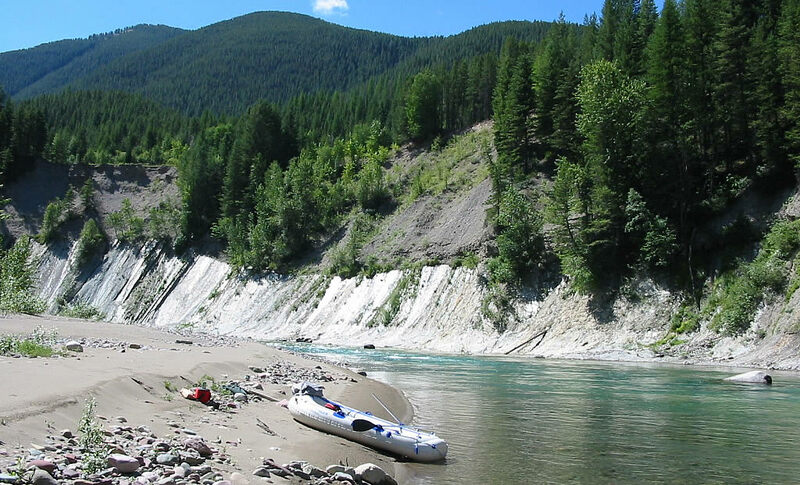 For most floats on rivers with Class II rapids or less, the lack of self-bailing isn’t a problem at all. However, when running powerful Class III rapids, it is almost inevitable that water will enter the boat. If you plan to only periodically run Class III rapids, bailing out water from the raft isn’t a huge deal. 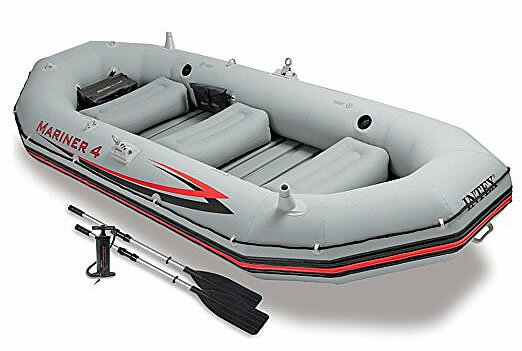 However, if you foresee lots of Class III rapids in your future, you might want to reconsider which type of inflatable boat meets your needs or only consider buying the Sea Eagle 9 raft. Finally, recreational inflatable rafts aren’t meant for the pounding that Class IV rapids inflicts on a boat. Their fabric isn’t as strong as is found on whitewater inflatable rafts, and their limited maneuverability makes it difficult to navigate fast-moving water. For this reason, if you want to float through Class IV rapids, these smaller, recreational level inflatable rafts aren’t the boat of choice. Most quality recreational inflatable rafts are constructed from a thick, flexible PVC material. It is very difficult to put a hole in this material—I’ve never put a hole or tear in my Sea Eagle raft despite owning it for 15+ years. However, this fabric becomes less flexible below freezing. And the colder the temperature, the more brittle the fabric becomes. As such, you don’t want to use most of the recreational inflatable rafts in sub-freezing temperatures. The one notable exception to this temperature limitation is the NRS PackRaft, which is constructed from a thicker and different material, but which also has a higher price than other recreational rafts. My Sea Eagle 8 on a rafting trip down the Middle Fork Flathead River outside Glacier National Park. Went through Class III whitewater just fine. My raft was replaced by the redesigned Sea Eagle 9 raft, which has many killer features I wish my raft had. There isn’t a large selection of quality recreational level inflatable rafts available today, perhaps because these types of inflatable boats just aren’t as popular as inflatable kayaks are. My guess is that the lack of flat-water paddling ability removes these boats from consideration by many paddlers. And for people who are serious into rafting or need enhanced durability/options in their boat, most rafters gravitate towards the larger, whitewater/expedition level series of inflatable rafts. As such, the recreational class of inflatable rafts has become a bit of an “orphan category.” There’s only a couple of good rafts I’d recommend in the $600 or less price range, and plenty I’d highly advise staying away from (run away from anything priced much less than $200 or so). Due to this somewhat constrained selection of rafts available, shopping for them is easier. So here’s some rafts I recommend. I own the smaller version of the Sea Eagle 9—the now discontinued Sea Eagle 8. I’ve owned it for 15+ years (and was the first Sea Eagle boat I owned) and it’s never developed any holes or tears. It’s been banged into rocks, tree limbs and dragged across all sorts of things that would have torn lesser quality inflatable rafts. The Sea Eagle 9 is one of the more versatile recreational inflatable rafts available, which is one reason I recommend it more than any other recreational raft. The raft has a huge weight capacity—over 1200 pounds. Optional floorboards are available, allowing the raft to convert to a solid fishing platform, especially when paired up with the optional motormount and trolling/gas motor. Another unique option available for these boats is the canopy. A removable high pressure floor with a tough nylon fabric. Allows for standing in the raft while preventing hooks from poking a hole in the floor. Floor drains – Allows water that enters the boat when running whitewater to drain out. Finally, the SE9 is very portable. Weighing just 35 lbs without the removable floor, it folds up neatly into it’s own bag and can be stuffed into any trunk. Total inflation time, using the manual pump, is about fifteen minutes once you get the hang of it. Total base price of the SE9 is around $450-$500. Also, the Sea Eagle 9 works just fine for multi-night float trips, or as the video below shows—multi-month float trips. I’ve yet to puncture my Sea Eagle 8 inflatable raft. One reason is due to raft’s fantastic construction. However, another reason is that I’m careful. This doesn’t mean I “baby” the boat while I’m river floating. Hardly. I’ve bounced into rocks at 6+mph with this boat, hit and dragged the raft over submerged rocks more often than I care to remember and have hit dozens of tree limbs. You see, normal river use is unlikely to lead to holes in the boat because these rafts are soft. Once you inflate them, you can easily push your finger into the fabric a good half-inch. This softness allows these rafts to essentially “bounce” off obstacles it hits. What puts holes in these types of rafts isn’t use on the water. Instead, what punctures these rafts is dragging them along the ground. In particular, a fine way to puncture these rafts is to drag them up a rocky or twig-strewn riverbank or lakeside. These rafts are designed to bounce—not be dragged. Thus, to prevent puncturing your new Sea Eagle raft, the procedure is simple. Carry your boat to the river once it’s inflated. And when you’re done with your float trip, carry the boat to where you’ll deflate it. And never, ever, just “drag” the boat behind you across the ground—as doing so is the #1 method of puncturing the boat. Designed for 1-2 paddlers, the NRS PackRaft is the most portable of the inflatable rafts I’d recommend in the recreational level category. Weighing just eight pounds, this raft literally packs up into its own tiny pack. As such, this raft is meant for paddlers who need to carry a boat deep into remote country—either to float down remote rivers or to be used as a fishing platform on backcountry lakes (although for fishing I’d suggest the Sea Eagle PackFish instead). The small size of this raft, however, does limit weight capacity. While there’s room for two people plus a bit of gear, this really is best used by solo paddlers. This raft also lacks the multitude of options that are available for the Sea Eagle 9. Base price of this raft is around $600 or so. The Intex Mariner 4 is a solid inflatable raft, albeit rather heavy. It is the least expensive good quality inflatable raft available, though. More info about the Mariner 4 at Amazon. The Intex Mariner 4 is one of the few “things that float” from Intex that I recommend. Unlike most other Intex boats, the Mariner 4 is a fairly tough boat. While made from a different material than the Sea Eagle or NRS PackRaft, the material is thick and doesn’t puncture easy provided you don’t drag the boat across the ground. If there’s one huge drawback with this raft it is the weight. The Intex 4 weighs a whopping 80 lbs, despite having less weight capacity (880lbs) than the Sea Eagle 9 (1200lbs). The reason for the reduction in weight capacity is that the Intex 4 lacks the huge air bladders of the Sea Eagle (a lot of air goes into inflating the Sea Eagle 9). Less air = less weight capacity. Due to the smaller pontoon size of the Intex 4, it is not advised to run this raft through any Class III rapid. Too much water will fill the raft and the rafts heavy weight somewhat constrains maneuverability. But the raft is fine for Class I and Class II rapids. The base Intex 4 Mariner is priced somewhat less than the Sea Eagle 9. And like the Sea Eagle 9, motors can be used with the boat. One nice benefit the raft has is an inflatable keel—which can make lake paddling a wee-bit easier (although don’t mistake an inflatable raft’s keel for an inflatable kayak’s keel—there’s a huge difference in performance). While the keel does make flat water paddling a bit easier, make no mistake—this is not a boat you want to paddle long distances. Similar to the Sea Eagle 9, this is a raft best used on rivers or used with a motor. Paddling should be limited to maneuvering and short flat water paddling stretches. Overall, if you have a severely constrained budget, the Intex 4 is a decent inflatable raft. Provided you take care of it (clean it, store it dry and don’t drag it along the rocks), the raft should provide many years of service. Typical price range of the base model raft is around $250 or so. Note – Stay away from other Intex rafts priced less than the Mariner 4. These cheap inflatable rafts simply do not hold up and constantly develop leaks. The Mariner 4 is constructed from a thicker, and much heavier, fabric (one reason the boat weighs so much). I’ve seen several inexpensive Intex inflatable rafts fail, one of which was on the seams—which makes repairs almost impossible. While the “floating recliners” and such from Intex work fine for the local pond and backyard pool, you don’t want to take many Intex products on a float where it’s a long walk back to your car if the boat fails.